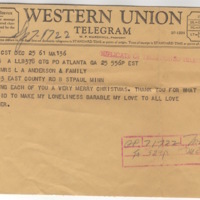 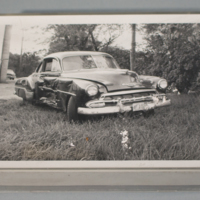 A Western Union telegram Marvin Anderson sent to his family on his first Christmas away from home while he studied at Morehouse College in Atlanta, GA.
A photograph of Marvin Anderson's first car, a used 1954 Chevy Coupe. 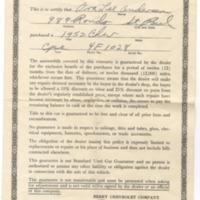 Ora Lee Anderson received this guarantee from the Berry Chevrolet Company for Marvin Anderson's first car, a 1954 Chevy Coupe. 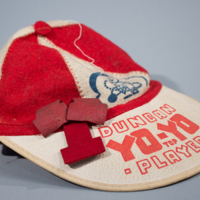 Marvin Anderson won this red and white striped cap when he competed in a Duncan Yo-Yo contest. 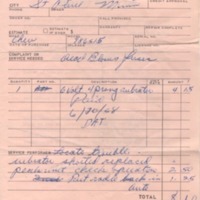 This is a rapid repair receipt from the Ecklen Radio Co. for Marvin Anderson's first car, a 1954 Chevy Coupe. A pocket watch, originally owned by Joseph Robert Jones who recieved the watch from his employer, the Great Northern Railway, in the 1920s. 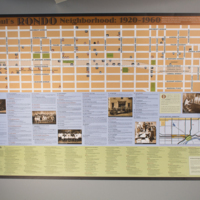 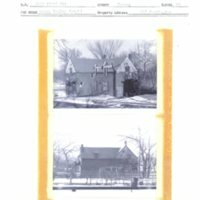 Map of the buildings, landmarks, businesses, and churches of the Old Rondo neighborhood before the interstate between the years 1920 and 1960, with historical details and photos below. 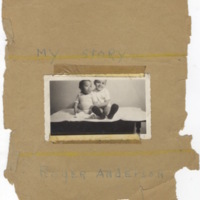 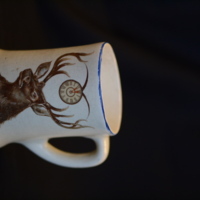 Compilation was completed in 2008.